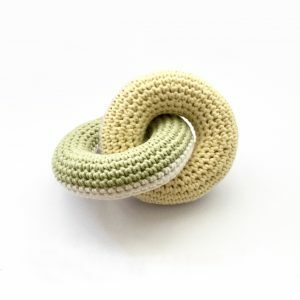 These interlocking rings make a fascinating tactile toy for a baby or small child or I’m sure you can think of many other uses! 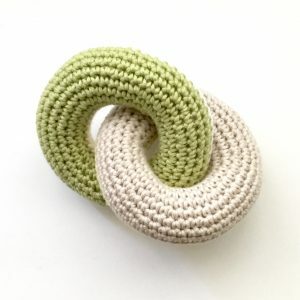 My linked rings crochet pattern takes you step-by-step through making the design in your choice of one, two, three or four colours. 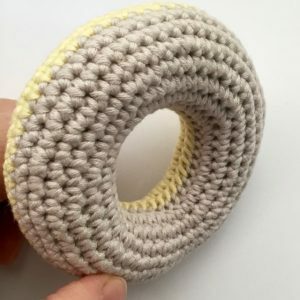 Made in DK (light worsted-weight) yarn with a 3.5mm (US: E/4) crochet hook, each ring is about 9cm (3.5 inches) in diameter, but you can always make them larger or smaller by varying your yarn and hook. If you’d like a head start, or to offer this as a gift to a new parent or grand-parent, I have created a kit with 100% organic cotton yarn (hurrah!) and natural wool stuffing. Choose the four-colour combination you prefer. 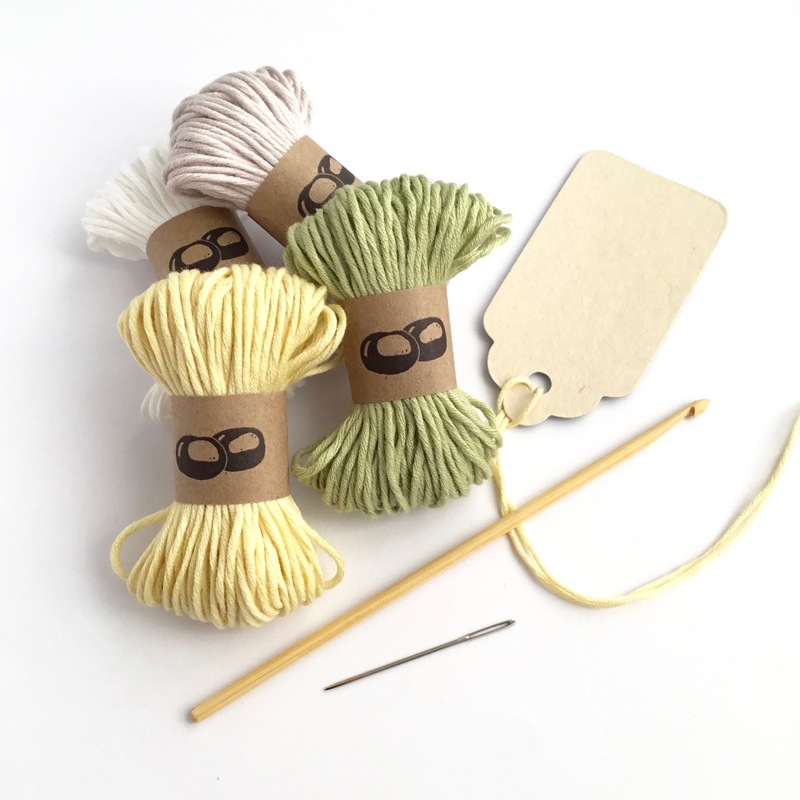 The kit includes a blunt-tipped yarn needle and (optionally) a lovely bamboo hook. Also included is a recycled gift tag should you want to give the finished article as a gift. 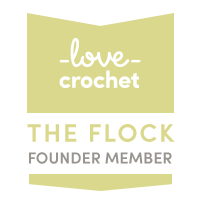 As always, UK and US crochet versions of the pattern are available. That’s not one document with some notes to help you convert things, that’s two entirely separate documents – one on A4 paper, using British English, UK crochet terms and metric measurements, one on US Letter paper, using US English, US crochet terms and US standard measurements. I do this with the aim of making whichever pattern you choose to use as readable as possible for you. For full details and to order the kit, please hop over to Etsy. 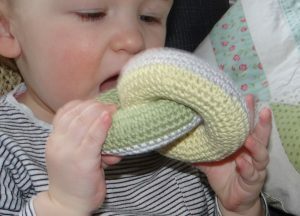 Plus anyone finding an error in the pattern can have another of my crochet patterns for free. My patterns are thoroughly reviewed and tested, but it’s always possible something gets overlooked! 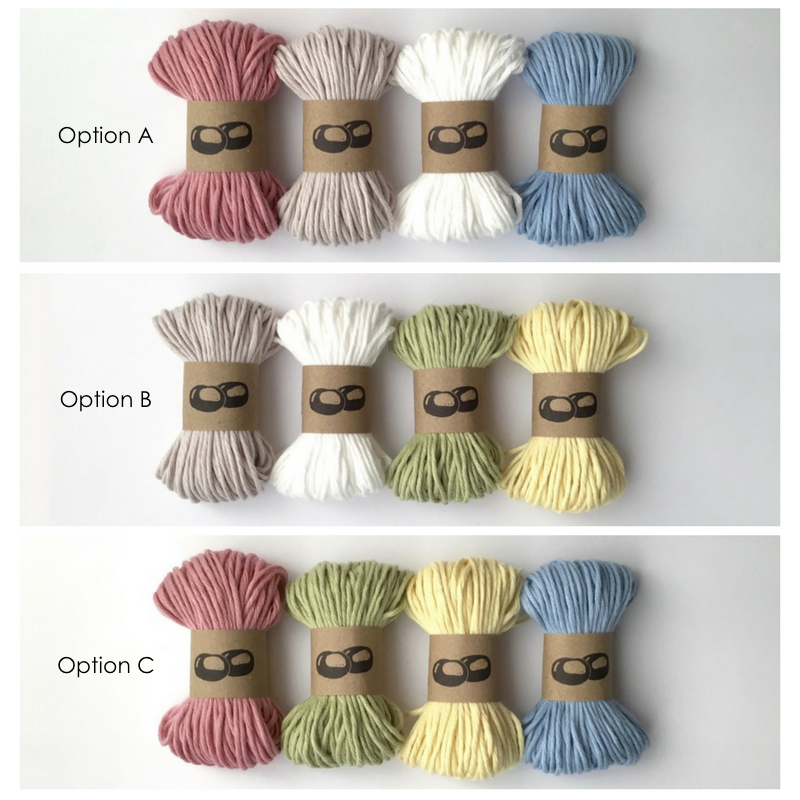 Check out my other eco-friendly crochet kits. Don’t forget to share pictures of anything you make from my patterns with the hashtag #LittleConkers on Twitter, Facebook and Pinterest – it makes me so excited to see what you create! 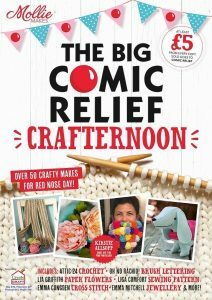 While I have your attention, I’m going to give another blatant plug to The Big Comic Relief Crafternoon magazine. An awesome collection of 50 handmade projects to get you creating, or just to drool over, and £5 from every purchase goes to Comic Relief. Available as physical paper magazines in larger Sainsbury’s stores or digitally from iTunes or GooglePlay. Click on the picture to find out more and to see some of the marvellous creations people have made. Search for #molliecrafternoon on social media.